While Giorgio Napolitano called for national unity in honor of the day, Italy feels anything but united. Political squabbles are continuous, and scandals and muckraking are a nearly daily occurrence. Trust in political parties seems to be at a low point, while a technocrat government headed by appointed Prime Minister Mario Monti struggles to make badly needed reforms in Italy while being faced with unpopular austerity measures, a huge deficit, high unemployment and an economic recession. I see a country in a fragile state of balance, and have the sense that Italians are scrambling in a free-for-all to grab what they can before the current government falls, or if it lasts until elections must be called in the spring of 2013, to at least shield oneself from the next blow. Though this is hardly new, it is still painfully sad. 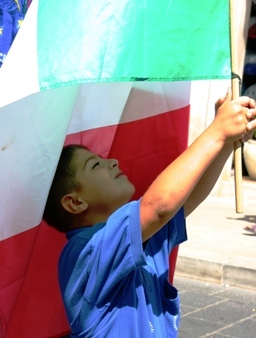 During my 24 years in Italy, the only time Italy felt truly united was in 2006, when it won the soccer World Cup. At least for a few weeks the citizens of Italy were all proud to be Italian. All that said, I’ll be celebrating just the same, with the hope that fervently believing in a united Republic is the first step to actually having one. Viva l’Italia!